You might have heard about the Windows XP Mode in Windows 7. It allows Windows 7 users with supported editions of Windows 7 (those are Windows 7 Professional and Windows 7 Ultimate) to run other Windows operating systems in a virtual environment. Microsoft calls it Windows Virtual PC of which Windows XP Mode is one possibility that is freely available for Windows 7 users with the right edition of the operating system. Running applications using Windows Virtual PC can be beneficial if the application - or hardware - is not compatible with Windows 7. Most Windows users will probably never come in the situation that they need to run the mode but those that do can download the required software to launch applications in the virtual environment with just one click in Windows 7. Next to the software requirements are hardware requirements. The computer needs to be able to run Windows XP Mode. More specifically it needs to support Hardware-assisted virtualization (HAV) and the option needs to be enabled in the computer's Bios. 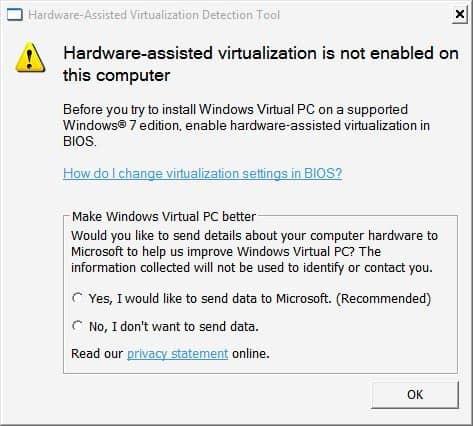 Microsoft has released the Hardware-Assisted Virtualization Detection Tool to give the user exact information if Hardware-Assisted Virtualization is supported by the computer and if it is enabled in the Bios. The program is compatible with all editions of Windows 7 as well as Windows Vista SP1 or SP2 and Windows XP SP3. The Hardware-Assisted Virtualization Detection Tool is a portable software program that will display the relevant information upon startup. It will either display that the cpu supports Hal and that it is enabled, that the cpu supports Hal but that it is not enabled in the Bios, that the cpu does not support Hal or that the operating system version is not compatible with the program. Information are provided for the second case. Great article Martin! I don’t plan to use Microsoft’s VirtualPC because I use virtualbox. I plan on upgrading to Windows 7 this Friday (waiting on a new hard drive). I was wondering if anyone else is using virtualbox in Windows 7 and will it run on 64 bit Windows 7. Thanks.